You can decide what happened, cuz for some reason no one here has a clue. the only thing we, well Joe, knows for sure is that Sam could not have done it. But I will tell you on our run tonite, I told Chris about it and she said I should check the news cuz maybe we had a small earthquake. And yes, I do believe she was not joking. But no, we did not have an earthquake. Good try. only you could make that bad accident look oh so good. Ha! 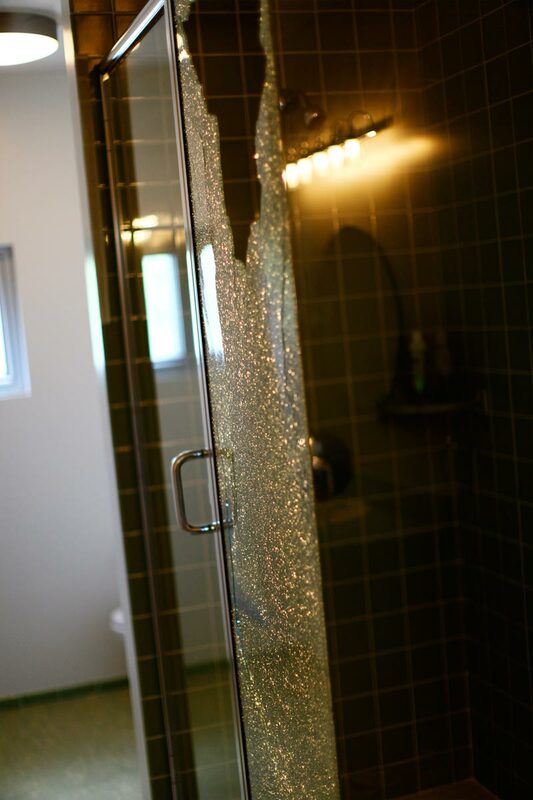 That is so funny–not the shower door being shattered, but the story. 🙂 My husband has three brothers and his mom says that “not me” was responsible for all wrong doings in her house. I don’t know what happened…..but CAAUUTE rug. I need that. In our house when something goes terribly wrong the kids say the invisible man did it…..Maybe he visited your house as well? Denise-believe it or not – the SAME thing happened at my parent’s house a few years ago. We were all gathered in the family room after dinner and heard a crash…the littles were all with us so we knew it wasn’t any of them…it was just a freak thing that happened! 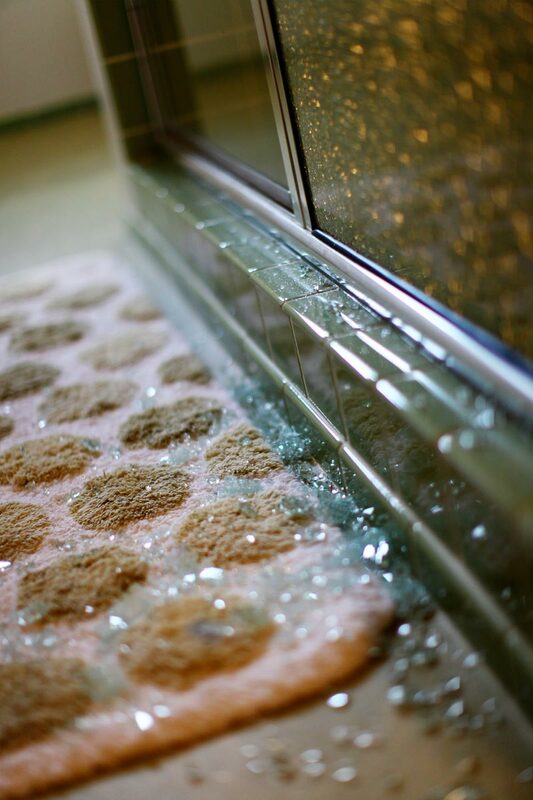 thank goodness there were no injuries…broken glass is so much easier to replace! I think my son Irie would find a kindred spirit in Gabe! If those two ever managed to meet they may create their own earthquake! SOMEONE slammed that door shut. Hehehe Boys! I am so sorry! Your new house! Im guessing a good old game of hide and seek. Someone picked the perfect hiding spot–the shower and slammed the door (by accident, of course) and it shattered??? NOT fun having THAT replaced that glass is EXPENSIVE!!!!! UGGGHHHH!!!! I think it was those trolls you disturbed during your move. Oh nooooo! I am with a previous poster and am going to say that someone was slaying a hideous buggie! For what it is worth, I recently knocked out the entire window in my Florida Room whilst attempting to slay a fly…. sigh. Happy that no one is hurt. Oh dear….that looks so familiar. Perhaps – and I’m not admitting to anything – there were some little people practicing their sword/light saber/baton twirling skills and needed to see the reflection. And these said little people did not fully grasp the concept of big objects in little spaces and what may happen. I don’t believe anyone in my home knew what happened either – maybe it is a roaming band of gnomes who travel the country breaking shower doors? BWWWAAAAAHAHAHA!! The looks on their faces…priceless! My husband said that maybe a bird flew into it. Humm… Yes, we had 2 boys, and he was worse than either of them, he slammed ours, and broke it. Cheap glass. Well atleast you got some really good pictures of it. When my daughter put white paint on our green couch, my one regret was not grabbing my camera. Good Job, your boys are way too cute!!! Do you believe in arranged marriages, because I have 2 darling little girls! Ok, here’s what E & G think: Joe knows who did it and how it happened, because he has a guilty-ish look on his face… like he’s hiding a secret. And they are pretty sure that Gabe did it, but he didn’t mean to. WOW!!!!! UMMM I’m thinking that someone was stuck in the shower and pounding to get out or maybe they saw a spider and wanted to kill it LOL 😉 Sorry Denise I probably would have had a heart attack. ok, that is BAAAAAAAAAAAAADDDD! bad boy(s)!!! eeek! Hmmm….I’m wondering if they were trying to see who could slam the door the hardest?? I say either it was some sort of ball or maybe it was just a “freak” accident and the glass just fell. Is my son visiting your house? This looks like something he could do. It would involve some sort of train, truck or tractor and being outraged by his older sister. I love Chris for trying to shift it to a natural disaster. But I agree, the boys did not do it. The Star Wars characters came to life to celebrate May the Fourth and things got out of hand. That’s my theory and I’m sticking to it. OMG, I hope everyone is ok!! !What could have broken the glass like that? it can’t be a bar of soap!! maybe a toy(car or truck)!! My baby Adam 10m old,couple days ago broke a very expensive piece of art that was given to me from my dearest friends!! And I couldn’t do a thing!except my body’s temperature was really up!!! I’ve got money that Gabe had something to do with it. My own sweet little boy gets that look daily. And he loves to send things flying through the air and then act like he has no idea what happened when something falls off a shelf. I tell him every day he’s very lucky he can be so sweet and is so cute. 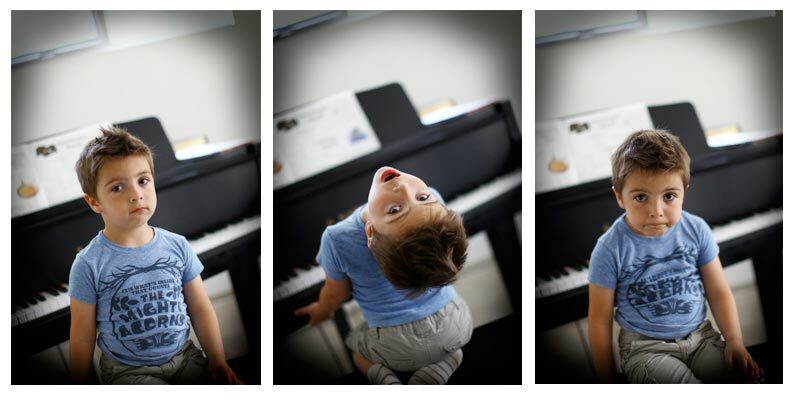 Ya, just when I thought I had the cutest babe..I get all these adorable pics in my email….okay, so Gabe is the best cute singer!! Does that make sense? Love her strawberry blonde hair..love it. And now I bid farewell to you all as I go to bed at a decent time tonite….finally. 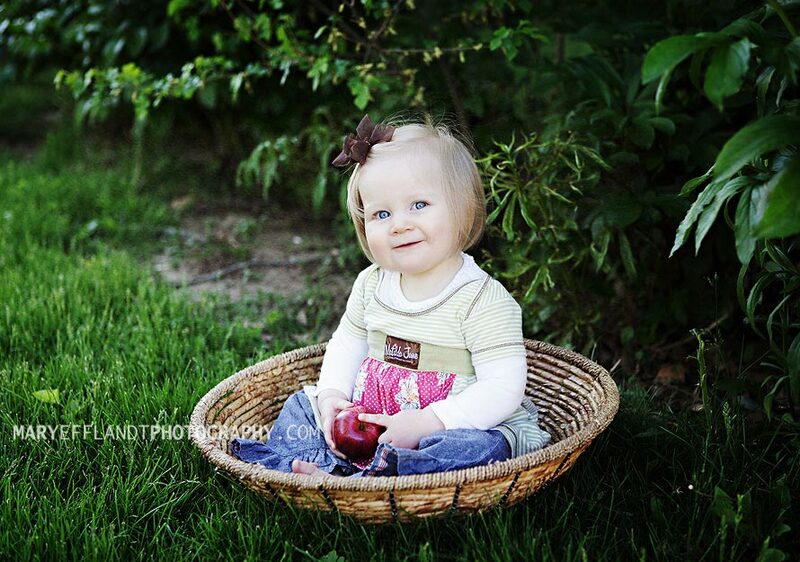 Love when my clients were Matilda Jane — so much fun! Happy to see one of my photos posted! oh i am so behind..tomorrow I am watching it..but I hear it is a tear jerker….Dang it as long as kate and Jack are ok, I’m ok! Thanks for posting my little strawberry blonde beauty! Just received the package from the fund raiser order. Thank you so much to Becky who helped me with the order. I was out of town and did not have computer access and had left my order info at home. Decided to call and describe the items and that worked just fine. Please tell me you watched Lost before going to bed at a decent hour!!!! Oh, I love the strawberry blonde girl too! All very beautiful pics of gorgeous girls! I wish I was that good of a photographer as these other very talented people. skye knot got a lot of play there…guess that is why it is pretty much sold out. Just curious, but can anyone send in pictures to possibly grace your blog or just “for real” photographers? And if so, how? OH how I heart that Skye knot. So gorgeous. After searching through about 5-6 CD’s for the cutest skirt I made years ago (okay 3), no luck. But I did find something real super cute. I’m sure many of you have seen it before, but…you know, he’s mine and I just really think he is cute. I mean just look at the size of his chubby arm compared to his hand. And yes, he was a fluffy chicken, no gel in that hair it is all natural. Back to work, thanks for looking and hopefully laughing a bit at this cute little beast of mine. OH MY GOSH DENISE!!!! What a cute little chicken, seriously, to DIE FOR!!! Awwwwwww! LOVE it! This reminds me of Jonah’s 9 month pics. He had the same hair, but white-blonde. He’ll be 14 this summer. It’s so much fun to look back through the baby pics! His little smile is so contagious! Thanks for sharing! Oh my goodness he is the cutest!!! This picture is wonderful. Thanks for sharing. I agree with Melanie this is one we could enjoy every day! what a sweet beast- especially after just watching him sing his Jedi song- love me some beast! Your “beast” is beyond adorable. Thanks for sharing the picture! What a precious picture of your little guy! I love it! I love chubby baby legs and arms. I could just gobble him up! Makes you nearly want another!! Too cute! Id love a little boy to grace our lives. i LOEV that age. so chubby and cute. i dont think i have ever seenm a pic of him that young!! love it! What a cutie!!! Love,love , love fuzzy baby hair and the semi toothless smile, just priceless!! So CUTE!!!! He still has that same adorable smile!!! We never tire of seeing the littles do we? and My how hes grown. Awwwwwww! I remember coming across this pic on your old blog for some “Figure Out Friday” contest… besides all the cuteness you mentioned, I just love that he’s wearing knitted overalls!! Did you make those? Wow, he is totally adorable & I think I do remember seeing this photo on your blog before, but you could post it every day..he is THAT adorable! And I never tire of cute baby smiles & first teeth & chubby little arms & squeezable cheeks! Omg Denise!!!! when I saw the title (The Beast) before scrolling down I didn’t know what to expect!!! what a sweet sweet picture, you should see the smile on my face 🙂 you just want to squeeze him and eat him :)He is a beauty. Those sweet days just go by way too fast. We never realize it at that moment, but those are the best days of your life.